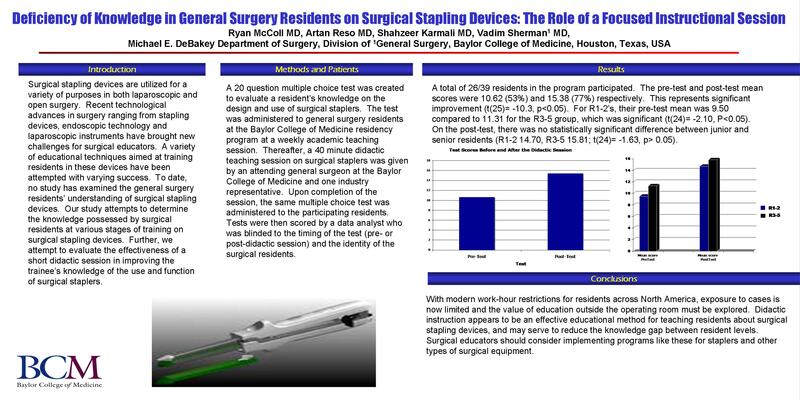 Introduction: There is a paucity of knowledge on the application and usage of common surgical stapling devices by general surgery residents. Our study aimed to elicit the deficiencies that exist in this particular area and assess a short term teaching strategy to determine if a didactic review of stapling devices would improve knowledge and skill in the application of these surgical devices. Methods. A 20 question multiple choice questionnaire was designed to assess three realms of questions regarding surgical staplers: circular, linear and laparoscopic. The questionnaire was administered to all available Clinical General Surgery residents at Baylor College of Medicine Residency program at a weekly academic teaching session. The residents were not aware of the reason for the meeting and were not allowed to pre-research or prepare for the questionnaire. The residents were assigned random numbers and were allotted 20 minutes to complete the questionnaire and the questionnaire was collected by a blinded data analyst and placed into envelope #1. Thereafter a 40 minute didactic session on surgical staplers was given by an attending general surgeon at the Baylor College of Medicine and one industry representative. Upon completion of the session the same questionnaire was re-taken by all attending surgical residents and 20 minutes was allotted for completion of this questionnaire. All questionnaires were collected by a blinded analyst and placed into envelope #2. Analysis was completed by the data analyst who was blinded to the timing of the test and the identity of surgical residents.